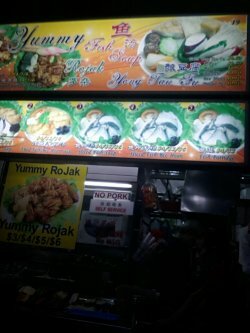 Though they sold other dishes, everyone in line was there for the rojak. Not too sure why they decided to offer other dishes cause it seems like their business was pretty good. In fact it makes you question their expertise and quality when other dishes are sold.I like watching people make rojak on the spot-- how quick and fast they are in cutting the vegetables. 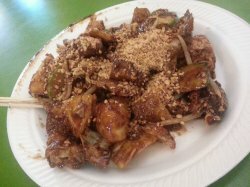 There were pineapples and beansprouts in this rojak, and though not a 'healthy' salad, it does make you eat some fruits and vegetables. 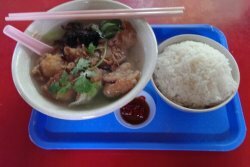 Fried fish soup $4. Rice 50centsThe slices of fried fish were not bad tasting. There was a bit of prawn taste, maybe they had put some powder with some prawn mixture, resulting in the taste. The soup smelled quite fishy though. If the soup was prepared well, it would be a great meal. There were some cabbage and bitter-gourd and 1 cube of tofu in it. The rice was not fragrant, perhaps low grade rice was used. The slices of fried fish were not bad tasting. 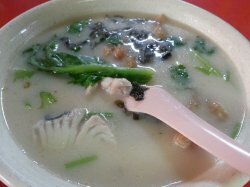 There was a bit of prawn taste, maybe they had put some powder with some prawn mixture, resulting in the taste. The soup smelled quite fishy though. If the soup was prepared well, it would be a great meal. There were some cabbage and bitter-gourd and 1 cube of tofu in it. The rice was not fragrant, perhaps low grade rice was used. 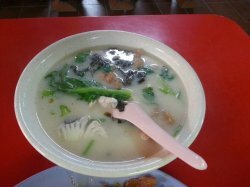 First to mention that the service needs improvement, i was seated right in-front of the stall yet the stall helper did not want to serve me the soup and insisted i collect it from the stalls, so much for being service oriented. Presentation wise, the soup looks on the lighter side for the evaporated milk version. I had the mixed fish combo so both sliced fish and fried fish are offered. The taste was a little disappointing, with me left feeling there's not much effort in the making of the soup.